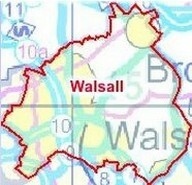 WALSALL is a large Metropolitan Borough, now part of the county of West Midlands, but formerly part of Staffordshire. Our Choral Society was founded in 1944 following a meeting called on 4th October by the town's Mayor, Councillor David Jones. The first Chorus Master was T W North, then Walsall Borough Organist, and the original accompanist was Horace Davis. The society's first concert was given on 14 February 1945. For almost half of its life, the Society was directed by Peter Morris, the current Borough Organist, who recently retired as Director of Music at St Peter's Collegiate Church, Wolverhampton. In 1998, the Society released an audio CD of Christmas music on the Lammas label. Copies of the CD remain available from the Society, price £5 [ contact us ]. You can listen to part of a track from the CD (LAMM025D) by clicking the image on the right.